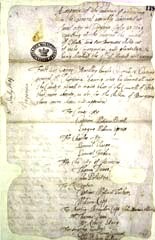 The document shown here is a list of burgesses elected to the first assembly at 'James city', 30 July 1619. Named after the reigning king, James I, Jamestown was founded by the Virginia Company of London, which had been granted a charter to establish colonies in America. It was to be the first permanent British settlement in North America.